OMNI Solutions delivers unparalleled expertise to commercial laundries. Our technologies and solutions deliver cleaner, softer results while optimizing operational efficiencies throughout the laundry facility. Our technologies are designed to adapt to and super charge both continuous batch washers and on-premise laundry systems. Our technologies utilize hydroxyl radicals to break down organic materials in the textiles and linens, providing outstanding cleaning and disinfection, while significantly reducing utility costs. 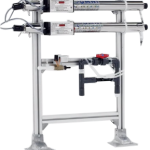 OMNI Solutions Smart Ultraviolet Light Advanced Oxidation System (SULAOS) has revolutionized the laundry process by dissolving organic materials through an enhanced oxidation process for Tunnel Washers. SULAOS reduces water and energy consumption, extends linen longevity, and most importantly increases employee and patient safety. Safeguard laundry from dangerous microbes and help ensure linen and textiles are hygienically clean. OMNI Solutions’ LUX Hydroxyl System supercharges in-house laundry systems. Utilizing a safe, UV technology, the LUX Generator turns room air into earth’s strongest oxidizer: Hydroxyl radicals. 500 times more powerful than hot water and bleach, the system kills bacteria viruses and superbugs and removes oil, dirt and stains better than detergents with hot water. Further, OMNI Solutions’ technologies reduce energy and consumption, extend the average linen life by 20% or more and offer a better operational efficiency in the laundry facility. The pressure to “go green” is making itself felt in the institutional laundry industry. Environmental regulations pertaining to the use of chemicals are speeding forward and concerns regarding water and energy conservation are more prevalent than ever. 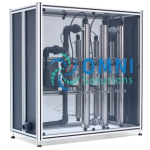 OMNI Solutions UV water treatment technologies are extremely effective in reducing bioburden in laundry systems, cooling towers, portable water tanks, and drinking water. Cooling tower water treatment is necessary to ensure an efficient process and long equipment service life. If cooling tower water is left untreated, organic growth, fouling, scaling, and corrosion can reduce plant productivity, cause plant downtime, and require costly equipment replacements down the road. OMNI Solutions UV technology removes damaging impurities from cooling tower feed water, circulation water and/or blowdown. OMNI Solutions’ UV technology is extremely affective in portable water tank disinfection. The UV process is quick, simple, inexpensive and environmentally friendly. Industrial disinfection applications may include: Dairy, pharmaceutical, cosmetics, breweries, chemical plans, bottling plants, electronics, marine industries, petroleum industries, textile industry, swimming pools, microelectronics, university, food industries, medical centers and research industries. Talk to an OMNI Solutions Water Specialist to determine the best OMNI product for your specific application needs.